Download "EVALUATION OF ADMINISTRATIVE PERSONNEL"
3 MONROE COUNTY 1220/page 3 of 5 For grades and subjects not assessed by Statewide, standardized assessments, the District shall measure student performance using the methodology set forth in the District's evaluation plan that is submitted to and approved by the FLDOE. B. Instructional Leadership At least one-third (1/3) of the performance evaluation must be based upon instructional leadership. Evaluation criteria for instructional leadership must include indicators based upon each of the leadership standards adopted by the State Board of Education under F.S including performance measures related to the effectiveness of classroom teachers in the school, the administrator's appropriate use of evaluation criteria and procedures, recruitment and retention of effective and highly effective classroom teachers, improvement in the percentage of instructional personnel evaluated at the highly effective or effective level, and other leadership practices that result in student learning growth. The system may include a means to give parents and instructional personnel an opportunity to provide input into the administrator's performance evaluation. 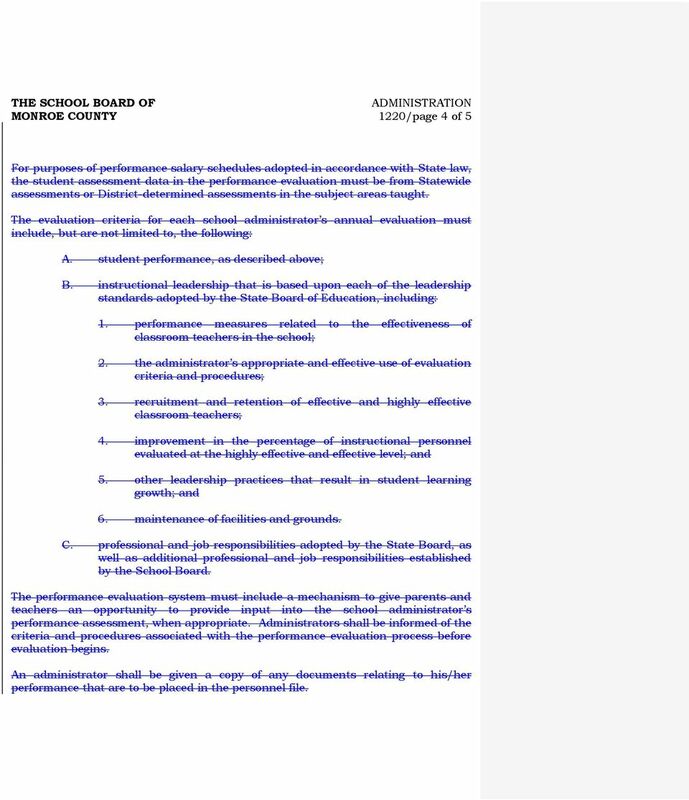 C. Other Indicators of Performance The remainder of a performance evaluation may include, but is not limited to, professional and job responsibilities as recommended by the State Board of Education or identified by the School Board. 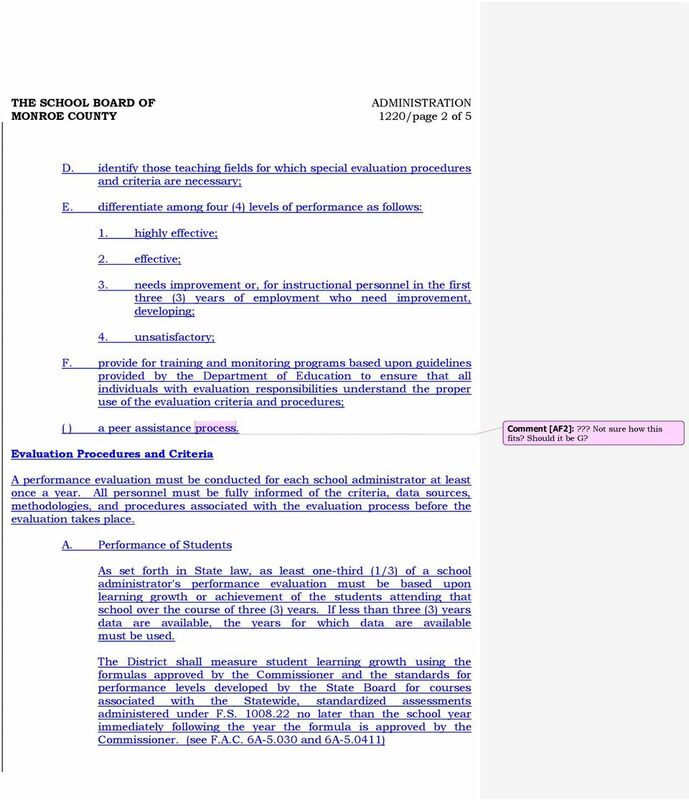 Annual Report of Evaluation Results As set forth in State law, at least fifty percent (50%) of each school administrator's performance evaluation, or forty percent (40%) if less than three (3) years of student performance data are available, must be based upon learning growth or achievement of the students attending that school; the remaining portion shall be based upon factors identified in the District-determined, State-approved evaluation system plan. Student achievement measures for courses associated with Statewide assessments may be used only if a Statewide growth formula has not been approved for that assessment or, for courses associated with School District assessments, if achievement is demonstrated to be a more appropriate measure of teacher performance. 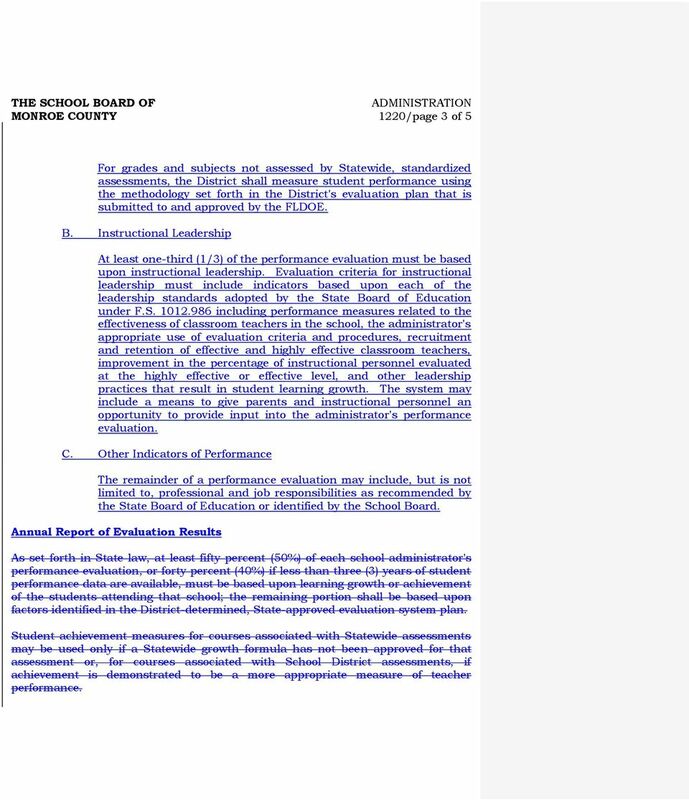 4 MONROE COUNTY 1220/page 4 of 5 For purposes of performance salary schedules adopted in accordance with State law, the student assessment data in the performance evaluation must be from Statewide assessments or District-determined assessments in the subject areas taught. 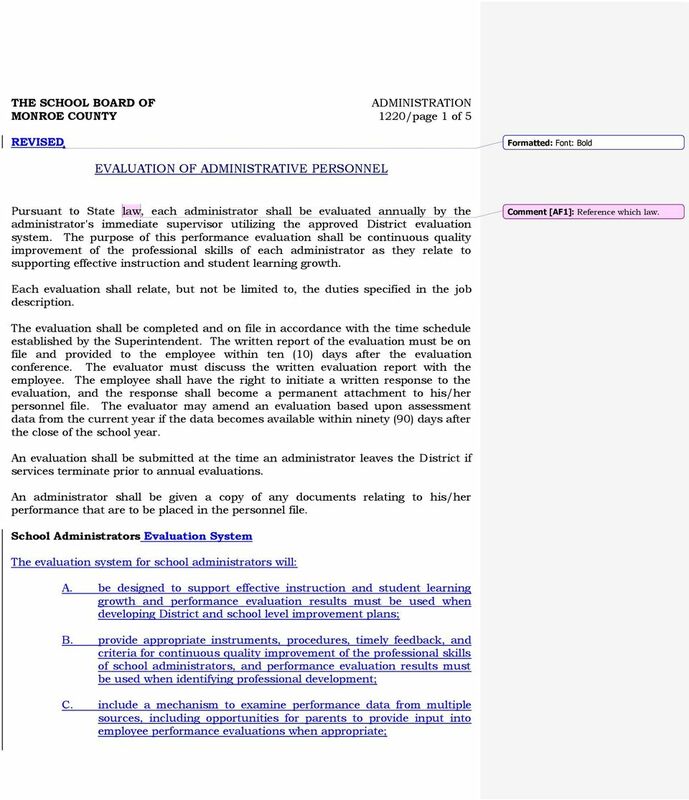 The evaluation criteria for each school administrator s annual evaluation must include, but are not limited to, the following: A. student performance, as described above; B. instructional leadership that is based upon each of the leadership standards adopted by the State Board of Education, including: 1. performance measures related to the effectiveness of classroom teachers in the school; 2. the administrator s appropriate and effective use of evaluation criteria and procedures; 3. recruitment and retention of effective and highly effective classroom teachers; 4. improvement in the percentage of instructional personnel evaluated at the highly effective and effective level; and 5. other leadership practices that result in student learning growth; and 6. maintenance of facilities and grounds. C. professional and job responsibilities adopted by the State Board, as well as additional professional and job responsibilities established by the School Board. The performance evaluation system must include a mechanism to give parents and teachers an opportunity to provide input into the school administrator s performance assessment, when appropriate. Administrators shall be informed of the criteria and procedures associated with the performance evaluation process before evaluation begins. An administrator shall be given a copy of any documents relating to his/her performance that are to be placed in the personnel file. OCSD School Leadership Program. Where Do We Stand and Where Are We Going? OCSD School Leadership Program Where Do We Stand and Where Are We Going? Florida s school leaders must possess the abilities and skills necessary to perform their designated tasks in a highperforming manner. This policy has been developed in consultation with teachers employed by the Board. (c) Eligible Student student, age 21 years or younger, who attends a public or private school or is in a home study program in the state of Georgia. Page 1 of 10 CODING: Words stricken are deletions; words underlined are additions. Code 14 - DUTIES AND RESPONSIBILITIES TABLE OF CONTENTS 14.01 PRINCIPALS 14.02 TEACHERS 14.03 STUDENT TEACHERS A. Supervision of Instruction B. 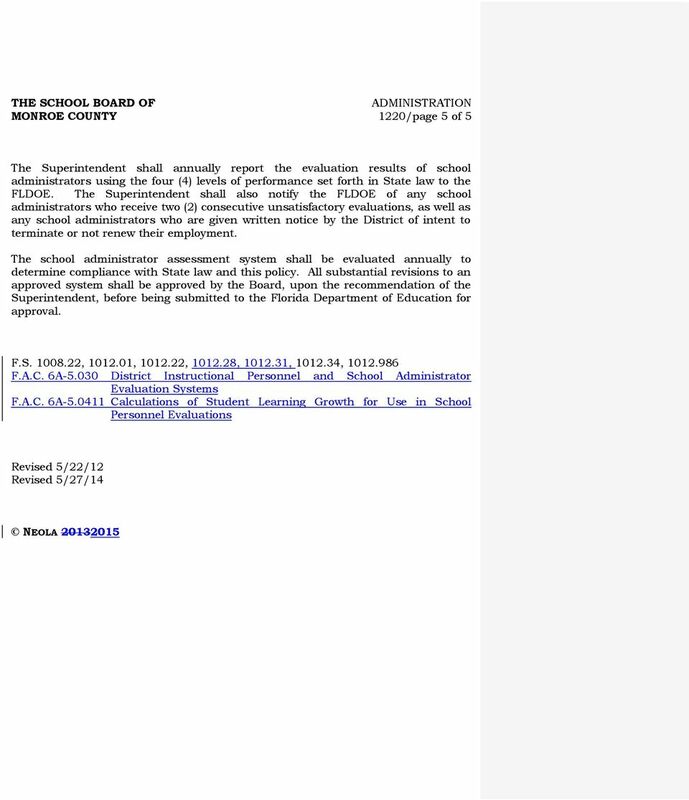 Supervision of School Property C. Make Recommendations D.
The word "supervisor," as used in this document, shall mean anyone who is in a rating capacity. 6. A written record of all observations, conferences, and summary evaluations.